"Family, Too" -- by BEKi. A "what if?" story. In this case, it's: "What if Will Riker wasn't an only child?" Read this story and find out. There are a few surprises in store for you. "For the Love and Dance" -- by Mindi French. A beautifully romantic piece, a Beverly Crusher "first love" story, this one's written as only a dancer could do it. "Practice Makes Perfect" -- by Margaret and Barbara O'Quinn. For all you Data fans who read Margaret O'Quinn's novel No High Ground, here's the promised companion love story to that one. In it, Rihana Kane convinces Data that even if he didn't get it right with Jenna in "In Theory," it's worth another try. He just shouldn't try so hard, and perhaps he picked the wrong woman. If you didn't read Maggie's novel, don't worry. This one does very nicely on its own merits, too. But beware! You're certain to want to read more about Lieutenant Kane after you meet her. "The Morning After" -- by Marianne Morici. Mornings after are often devastating, or at least embarrassing, as Beverly Crusher discovers in this post-"The Host" vignette. "Rozah" -- by Gail J. Christison. A bittersweet Picard romance, with more than a touch of action-adventure and even some hurt/comfort thrown in. This one would have made a great episode on television. "Future Perfect" -- by Jordan Trevor. An alternative to the "Future Imperfect" episode. Clearly many will like this idea better. "Replacements" -- by Sandi K. Almany. An excellent first story from this author. This is the second of three Data "romances" in this issue, and I, for one, found it very intriguing how completely differently the three authors depicted our beloved android as he tests the waters of romance. "Morning Tea" -- by Barbara Robertson. A Picard/Crusher story--with a twist! "Parenthood" -- by Carol Davis. An exploration some of the possibilities in the Riker/Troi relationship. "Battle Scars" -- by Wendy Scott. 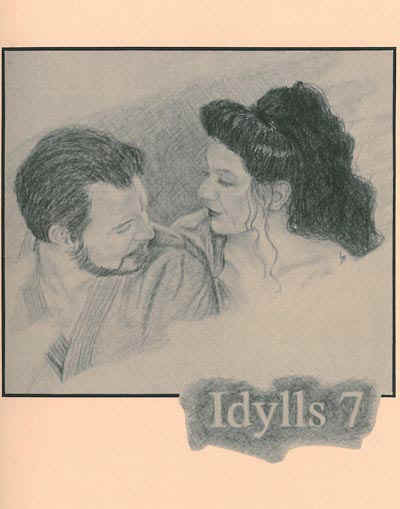 A great Riker/Troi story, whatever you think their relationship is. "One More Hurdle" -- by Jo-Ann Lassiter. One of the best Picard/Crusher writers around finds new layers to their relationship. "Heart to Heart" -- by Andra Marie Muller. A "what if?" story. If Deanna Troi hadn't regained her empathic powers after "The Loss," could she have continued as Ship's Counselor? Perhaps...with a little help from a very special friend. "Skinny-Dip" -- by Cyndi Bayless Overstreet. What a story! Featuring Data, of course, but to tell you more than that would be cheating, except for a special warning on this one: it's hot! So much so it sizzles. The title itself is a good hint, so proceed at your own risk! Poetry by Almany and O'Quinn. Artwork by Baker, Byrd, Caldwell, Hardeman, Lawrence, O'Quinn, and Wong. 186 pages, 8½" x 11" size, comb binding.